I spent a recent Sunday ripping turf from the front lawn of our house as part of a garden expansion project. It’s not the first time I’ve removed turf grass though it may have been the most painful! This grass was very healthy and had a good grip on the soil below. It had rained about five days earlier, but the lawn had had time to dry, the weather was fine and it seemed like a good day to rip the lawn. I’m a long way from having the front of our house look the way I want it to, but this bed which will feature trees, spring bulbs and a native groundcover is a good start. I know there are other ways to remove sod (detailed below), and I’ve done most of them. But because the space was relatively small and I did not want to do anything to hurt my back, which is a bit tetchy, I decided cutting the lawn in small pieces using a sharp shovel and then pulling them up by hand was probably the way to go. The method is detailed in this video by the folks at Garden Answer. The good news: my back felt great when I was done. The bad news: my hands and arms were in agony. It seems that pulling sod up by the roots for several hours is a serious work out. What else could I have done to remove the sod? Here are four other options. The sod kicker. I’ve used this tool before and knew it would wreck havoc on the back. The sod kicker looks like an old-fashioned person-powered plow, with a sharp blade between the two handles at the bottom and a wooden or metal rod a foot or so above that. You place the blade under the sod, then give it a kick on the rod. The kick moves the blade under the sod, giving you a neat cut. After it’s cut, you roll the sod up and haul it away. At least that’s the theory. I used a sod kicker at our garden in Northfield many years ago, and maybe the blade was not that sharp or my latent lack of coordination kicked in, but I could not get the blade to advance very far with each kick. (I vaguely recall giving one mighty kick and ending up on my rear-end in the dirt.) Nope. The sod kicker was out. Rototilling. My next-door neighbors did this when they dug up part of their yard last year. You rent a Rototiller, then roll it around the area you want to remove the grass from. Once the grass is all turned up, you pick up the sod bits, shake off the dirt and plant your garden. I’ve always been wary of this method because you inevitably leave lots of bits of sod in the area, meaning you will spend years pulling grass from the bed. Rototilling is also a great way to dig up weed seeds buried in the soil and plant them in your new garden. Finally, while I did not want my sod anymore, it was good stuff, and through the magic of the neighborhood online message board, most of it went to good homes. The Smother Method. This is my preferred method of transforming lawn to garden. As I’ve detailed on the blog before, the smother method (sometimes called the lasagna method) takes much less muscle but requires more time. 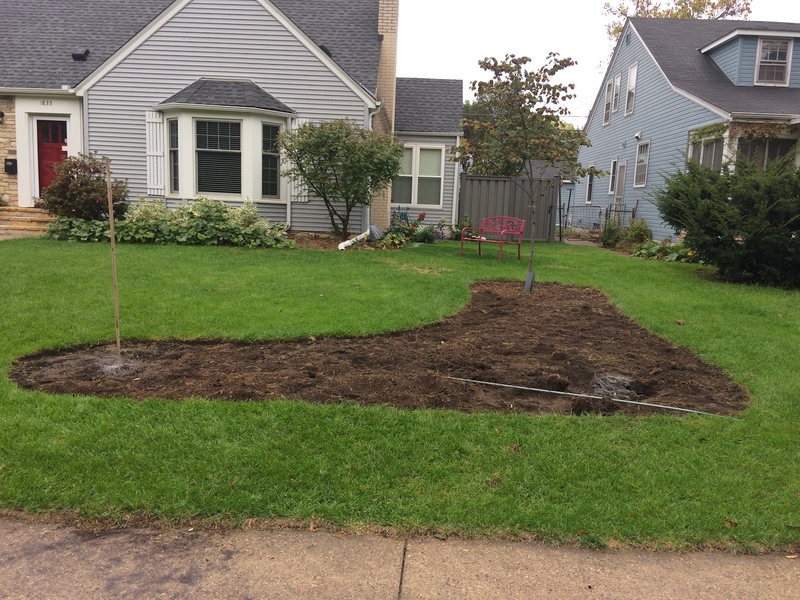 You wet the area you want to remove sod from, put down layers of cardboard or newspapers, then cover it all with soil or mulch and wait until the next spring. I considered using the this method but … well, I just really wanted to get going on my new front garden design, which includes planting two more trees and a whole bunch of bulbs in this garden area. And, as gardeners know, fall is a great time to plant trees. This is not the first time my impatience has caused me pain. Hire it done. Yes, I could have (and probably should have) paid for help. But again, impatient. When I rip all the sod from the boulevard, which is part of next year’s projects, I’ll be looking for young people with strong backs to lend a hand. Send names. Further good news: The project is complete, my hands are no longer swollen, and by the end of the week, two trees and about 300 crocus, daffodils, snow drops and other minor bulbs (no tulips!) will be planted. A few bags of mulch to cover and it will be mission accomplished! What are your fall gardening plans?